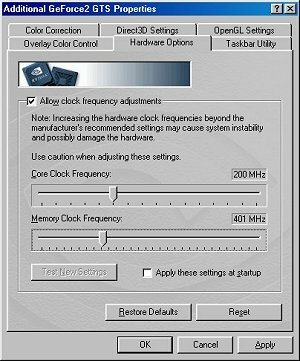 Nvidia Coolbits.reg available here, showing the default Hercules Pro core and memory speed. Hercules runs its 3D boards at the fastest achievable speed. With specially adapted RAM heatsinks, Hercules gives 3D Prophet II GTS Pro stability at higher clock rates. Within the Abit KT7 BIOS all the performance features where turned on, Fast Writes, 4* AGP. Memory was set at turbo with 4 way interleave turned on. I chose Quake 3 as the first benchmark, I ran demo001 at various settings, this time because this is a fast gaming card I limited my tests mainly to maximum details settings. I ran the CPU at 1300Mhz, the graph below shows the FPS scored for the Graphics card, the "c" denotes overclocked Graphics Card score. You can really see that overclocking the Pro gives big gains in FPS a whopping 11FPS difference in 1600 resolution, in the lower resolutions, the gains are bigger nearly 20FPS at the regular 1024*768 resolution, over clocking this card is definately worthwhile to get the maximim performance from it. With the memory running at 495hz it is well above the Memory speed of the default Hercules Ultra. 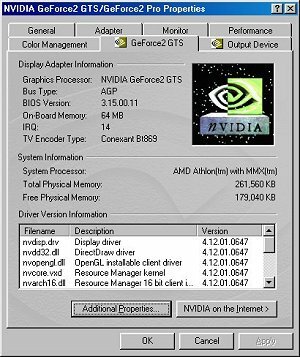 At this speed it does produce artifacts on the screen, but this card can run all day at 460Mhz memory speed that the Ultra ships with (O:, 475Mhz runs fine as well for that bit extra speed. The core on this card doesn't overclock that much though, but every card is different so your results may vary. The differences at this resolution aren't as marked because the CPU is limiting the card in the lower resolutions, but with the CPU at 700Mhz the top score is still 54.5FPS in 1600*1200 resolution, thus proving that my benchmarking is fairly accurate, for one thing, and that the Graphics card becomes the bottleneck at 1600resolution. I ran Unreal Tournament, but this time I chose a the time demo, Thunder available here, this benchmark is slightly less CPU limited and provides a bit of a change from running endless loops of UTbench.dem. Again I ran at 1300Mhz, and 700Mhz, all the timedemo's where run in 32 bit colour, with default settings in UT. Dynamic lights where turned off. Since UT doesn't really respond much to overclocking the video card I left it at default settings of 200Mhz Core 400Mhz memory and ran the tests at both CPU speeds as shown on the graph above. In all the resolutions, the Hercules Pro mananges to hit the 60FPS barrier, which is a good thing hehe (O:. I dont really notice much of a difference at 1280 resolution, I usually play at 1024*768 resolution. Again I used 3dmark 2000 available here , it's 18MB but well worth the download to check your system performance out. The Hercules Card proved to be very stable and fast, although not as stunningly fast as the Hercules Ultra it sells for around £100 less and as such offers greater value for money, maybe allowing you to upgrade the sound card or RAM as well, to take care of the cool games that this card allows you to play. I like this card a lot and it makes you question whether of not the Ultra really worth the extra, having said that the Ultra is that bit faster, and offers DVI output as well, For the Ultimate gaming computer the Ultra is still the way to go, but the Pro is nearly on the same level in most of the games, so it is ideal, for those not quite so fanatical about those extra few 3dmarks or FPS. Having said all that I would recommend the Hercules Pro, to anyone who wants to play any game, available, because this card has the power to do it (O: and do it, and do it well, with full 32 bit colour and brilliant driver support. (O: THE END.